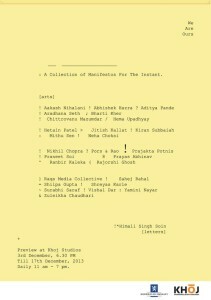 Curated by Himali Singh Soin at Khoj, New Delhi. Historically, manifestos were made on the brink of great revolutions, of wars and the end of wars, of individuals seeking a collective voice and a mass dispersal of a firm statement of sentiment, solidarity and safety. They are now a somewhat antiquated form, perhaps irrelevant, perhaps already omnipresent. The purpose of commissioning aesthetic manifestos was to create a constellation of manifestations of the ideas that lie between the artist and the history of art, its institutions and its socio-cultural origins, between the person and the existential, and finally to place them in a more poetic, other-dimensional space where the image of what they have to say transcends the meaning of what it says. The list of artists includes a selection of artists whose practices are founded in their conceptual and philosophical engagement with the ways we live within forms. They will be utilizing the common form—in function or in idea—of the A4 sheet of paper, a studio standard, a reproducible flyer, a simultaneous symbol of the dawn of industrialization and its demise in the face of a digital revolution. You know the silence after the symphony? You know the segment of sound that follows? That’s the coda. 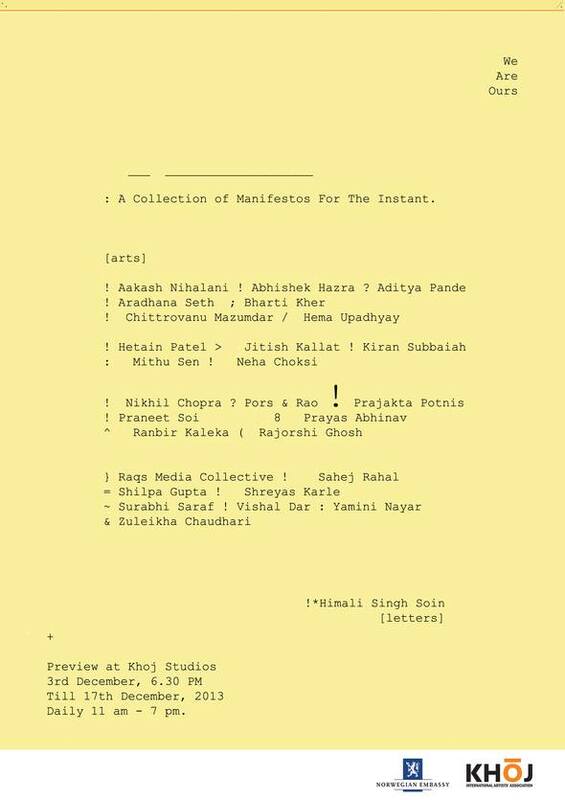 This entry was posted in Neha Choksi, Raqs Media Collective, Shreyas Karle and tagged A Collection of Manifestos for the Instant, Himali Singh Soin, Neha Choksi, Raqs Media Collective, Shreyas Karle. Bookmark the permalink.